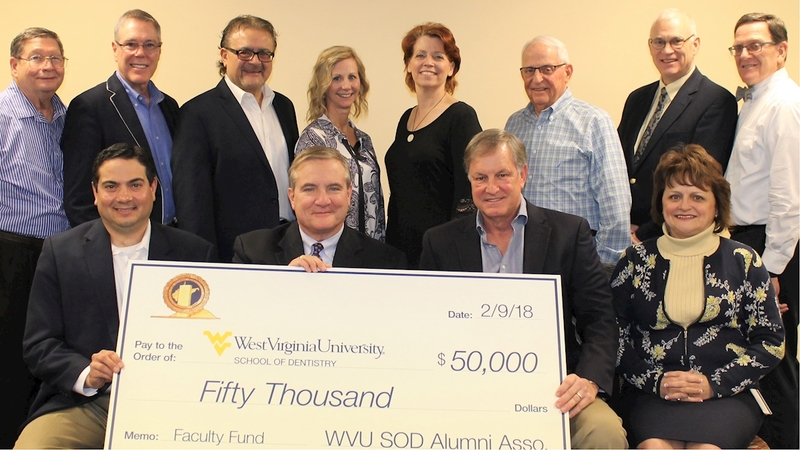 A $50,000 donation to the West Virginia University School of Dentistry will help foster efforts to recruit additional faculty and provide resources for faculty development. As the Board of Governors for the WVU School of Dentistry Alumni Association gathered Friday, February 9, board president Dr. Ron Richardson presented a check to Dr. Tom Borgia, Dean of the School of Dentistry. The WVU School of Dentistry Faculty Fund exists to primarily support recruitment of the best dentists to lead the school’s nearly 300 dental and dental hygiene students to successful careers in oral health care. Borgia said the school has current faculty needs in several departments, most notably in research and in pediatric dentistry. In November, during WVU’s first Day of Giving encouraging philanthropic pledges, Richardson and additional leadership within the School of Dentistry’s Alumni Association generously committed financial support to bring in the most qualified candidates in endodontics, periodontics, orthodontics, pediatric dentistry and oral and maxillofacial surgery. According to Karen Coombs, School of Dentistry Director of Development, the recent $50,000 gift could be just the beginning. In West Virginia, approximately 80% of the practicing dentists are graduates of WVU School of Dentistry, the state’s only dental school. In addition to lecturing, lab and clinical instruction, WVU School of Dentistry faculty members participate in the faculty practice treating patients regularly. Those interested in learning more about the School of Dentistry faculty fund should contact Karen.Coombs@hsc.wvu.edu.